Professional race engine builders approached Vibratech TVD, parent company to Fluidampr. The challenge was to apply durable, industry proven viscous damper technology to motorsports. It was the mid-80’s. Fluidampr was born. 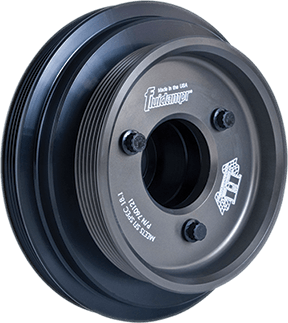 Today, racing demands a quality crankshaft damper that can protect engines across a broad RPM range. It needs to perform when you add horsepower and increase the temperatures under the hood. Racing pushes innovation in our design and manufacturing process. These advancements are passed on to our parent company, Vibratech TVD, and applied to exotic automotive, marine performance, and defense industry OEM applications. OEM factory race teams and grassroots Saturday night racers have made us the leading viscous harmonic balancer in motorsports. Hot rodders and restorers trust Fluidampr. Performance Diesel competitors value our diesel heritage and high power experience. Import owners like how we optimize damper design and performance to their engine’s needs. We are all American made, shipped word-wide, and proud of it. Fluidampr performance dampers is the brand name you know. Parent company, Vibratech TVD is where the science happens. Automotive performance powertrain engineers, production engine builders and aftermarket performance kit manufacturers have an experienced partner through Fluidampr to develop and integrate turn-key torsional dampers with exceptional quality. Contact us for consultation. At our core Vibratech TVD is a torsional vibration solutions provider to OEMs and their suppliers. We offer the widest application experience of torsional viscous dampers in the industry. From 1.1lb (0.5kg) automotive cam dampers to 7,000lb (3,175kg) gas compression pumping engine crankshaft dampers. 100hp to 25,000hp. 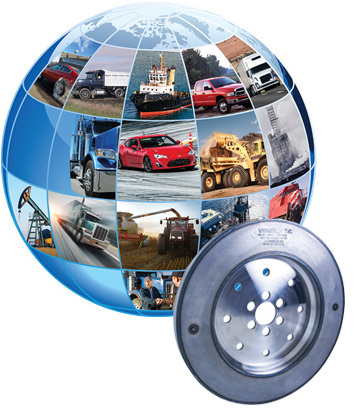 Vibratech TVD is also leading into tomorrow with new highly durable narrow-range viscous damper designs to minimize targeted NVH in commercial electric drivetrains. For consultation and pricing, call (716) 592-1000 or visit VibratechTVD.com.